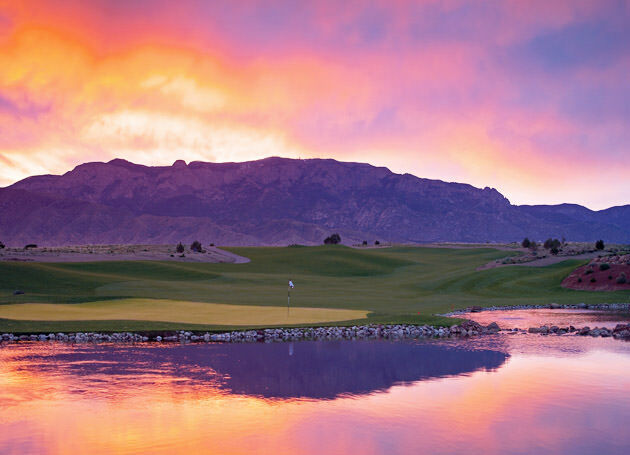 Just five hours south of Denver, along the Santa Fe-to-Albuquerque corridor, lie New Mexico’s premier, high-desert golf properties of Towa, Sandia, Black Mesa, Twin Warriors and Paa-Ko Ridge. 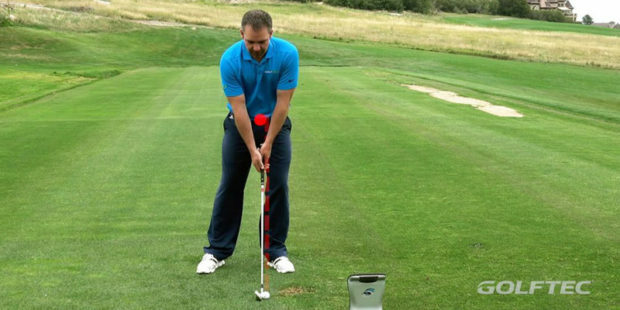 If you’ve had the notion to tee it up anywhere in Colorado this early spring season, one thing definitely stands out: the lack of green on the greens — and on the fairways and tees — is a reflection of the state’s highly disappointing winter snows. Greenkeepers agree Colorado’s usually robust April/May conditions will take some time to return, but why wait? 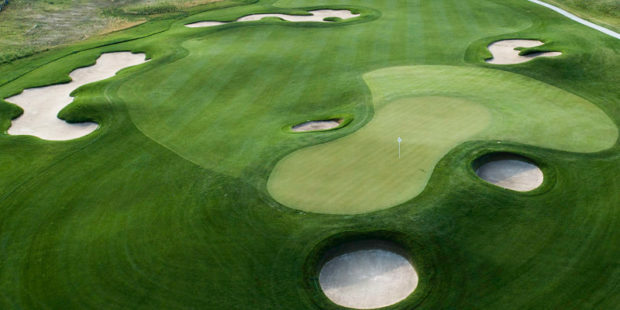 If you love to play golf on delightfully manicured turf, dozens of courses in nearby states await. 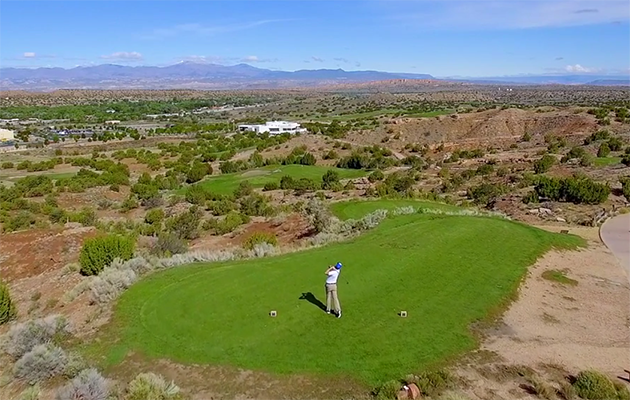 One such place is a mere five hours south of Denver—New Mexico’s premier, high desert golf properties on the Santa Fe-to-Albuquerque corridor. 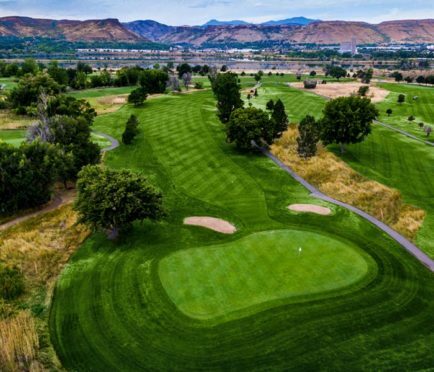 The first must-play is Towa Golf Club, a 27-hole high desert course designed by Hale Irwin (Piñon and Valley Nines) and William Phillips (Boulder Nine). Featuring tumbling Pojoaque Valley desertscapes, unobstructed views of the Jemez Mountains and the state’s only island green, Towa is a leading guest amenity of the Hilton Santa Fe Buffalo Thunder resort. For a special introductory greens fee (codeword is “divot”), call (505) 455-9000. Don’t overlook the municipal Marty Sanchez Links de Santa Fe, a tree-lined, 7272-yard Baxter Spann layout with 360-degree mountain views. The course celebrates its 20th anniversary this year with numerous specials. Well-connected golfers should definitely reach out and play ultra-private The Club at Las Campanas and its 36-hole Jack Nicklaus-designed complex. Short of that, Santa Fe offers myriad opportunities to experience one of the most captivating and historic destinations in America. 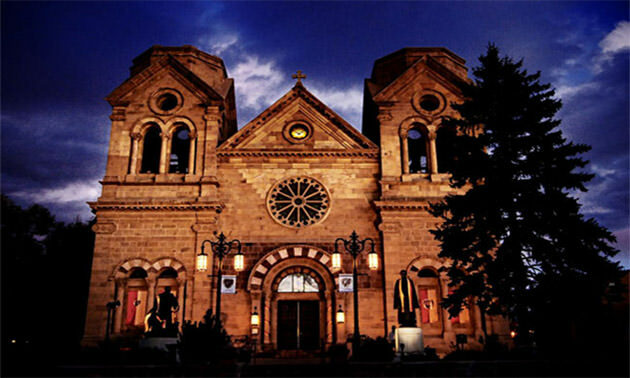 For a treasured taste, go explore The City Different’s celebrated attractions like the Santa Fe Opera House, Loretto Chapel, Palace of the Governors, Georgia O’Keeffe Museum and the Cathedral Basilica of Saint Francis of Assisi. 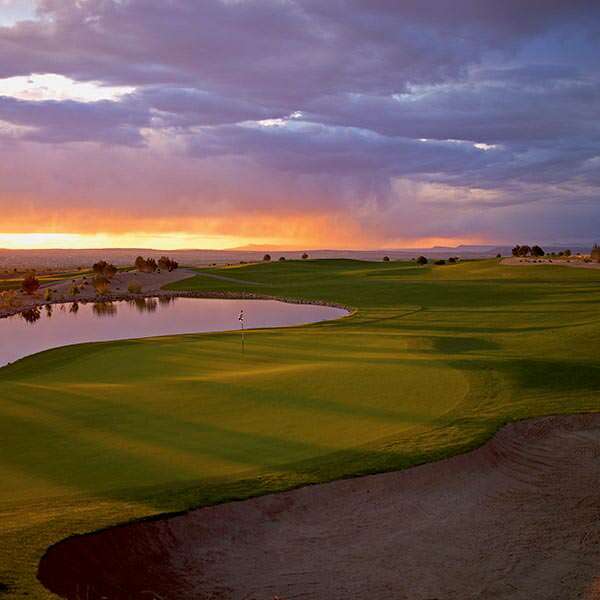 Your next stops should definitely include one or both courses located just north of Albuquerque—Sandia Golf Club (crafted by Scott Miller) and Twin Warriors Golf Club ( Gary Panks). Both are easily accessed off I-25, they’re superbly designed and conditioned, and both offer terrific stay-and-play packages at either the Sandia Resort & Casino or the Hyatt Regency Tamaya Resort & Spa. 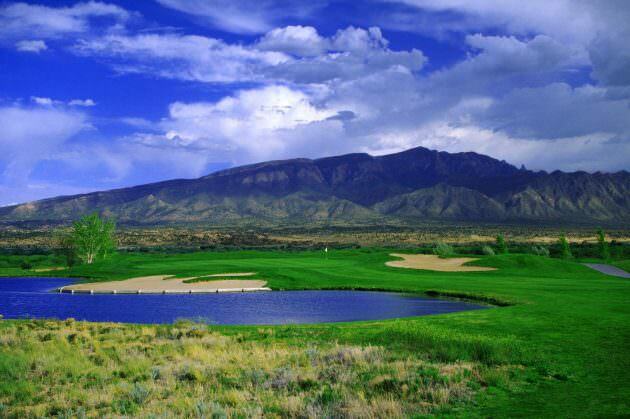 Before heading home, treat yourself to 27 holes of exquisite golf on east side of the Sandia Mountains, at the Ken Dye-designed Paa-Ko Ridge Golf Club. With elevations ranging from 6,500 to 7,000 feet, the layout features landing areas and greens separated by arroyos, native vegetation and rock outcroppings. Celebrated by national golf publications since its opening in 2000, Paa-Ko Ridge provides the exclamation point to a memorable golf road trip. 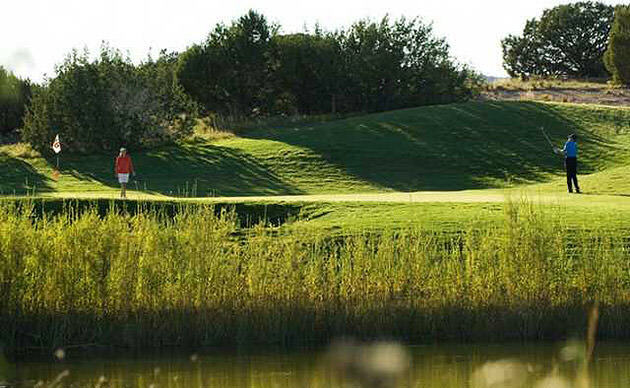 For more about these amazing golf experiences and more, go online to golfonthesantafetrail.com or santafe.org.